PEACEMAKERS EXPEDITION & SAFARI: Start Your Deluxe Stay At Tarangire Safari Lodge To Find The Safari Activity? Start Your Deluxe Stay At Tarangire Safari Lodge To Find The Safari Activity? Whether the purpose of travel is for business or pleasure, there is always one thing common in traveler's mind how to return safely back home at the end of the journey. To awaken quite alone in a strange town is one of the pleasantest sensations in the world. And if it is an African country and you are in a most sophisticated lodge in Tanzania like Tarangire Safari Lodge, then it is awfully exciting. A very luxurious lodge, with a breath taking view of one of the most stunning views in the world. Tarangire have the safari lodge on the Northern circuit of Tanzania. Often overshadowed by the Serengeti and the Ngorongoro Crater, Tarangire has huge concentrations of animals in the peak months. The Tarangire National Park is well known for its varied habitats and constant supply of water - making it the perfect place to host a diversity of wildlife. The area is famous for its large population of elephants where herds of up to 600 can be seen at a time. The park is also home to lion, leopard, wildebeest, zebra, waterbuck, hartebeest, and giraffe with their fantastic lengthy horns. The Tarangire is a haven for bird enthusiasts with more than 550 species of birds. With the luxurious staying in Tarangire Safari Lodge, the viewers leave this place with the fantastic memories of exciting gem viewing in the park. Tarangire Safari Lodge is situated in an impressive hilltop position deep inside the reserve, with extensive views from camp of wildlife along the river. 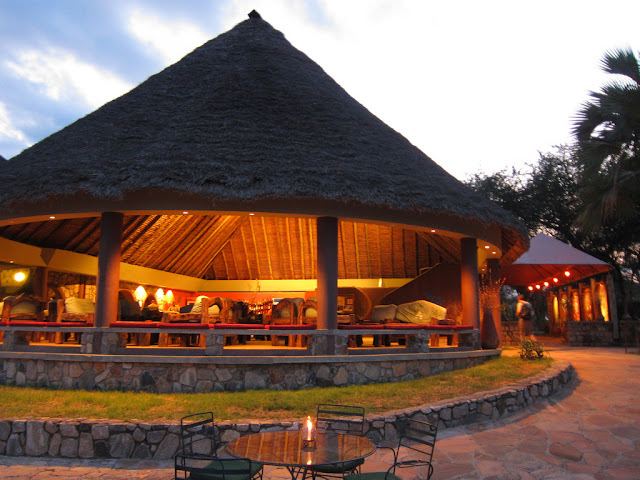 After a long day of wildlife viewing in Tarangire National Park, the Tarangire Safari Lodge seems like a mirage. The location, high above the Tarangire River, provides an endless view that often includes many animals’ elephants, lions, Cape buffalo, wildebeest, zebras and many more. However, the star attraction of this lodge is the amazing views from the communal lounge/ sitting area overlooking from above the landscape and river below, oftentimes with elephants, zebras, and other animals visible. You may find waterbuck, zebra, wildebeest and even a giraffe outside your cottage. Experience the unmatched view of the Tarangire National Park from Tarangire Safari Lodge with PEACEMAKERS EXPEDITION a local travel agency which has great knowledge and expertise on travelling business. Take a unique experience of staying in Tarangire Safari Lodge in the midlist of the nature with all comfort of a luxury lodge in a metropolitan city and additionally getting to see the wilds in their habitat from the windows of your room. Besides pre-designing your tour plan within your budget we would stay with you from your arrival to departure. You will have a native feeling with us and you must be swept away with our world class services. If you would like to know more about the types of accommodation available in Tanzania, or would like to book a Tanzania safari, then stay at Tarangire Safari Lodge for unique and exciting safari holidays.